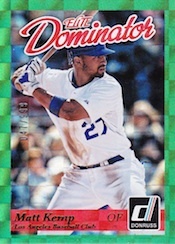 It has been a while since the base Donruss brand has hit the diamond. 2005 to be exact. 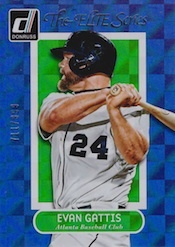 2014 Donruss Baseball brings back a lot of familiar names from the past connected to the brand's heyday of the 1980s and early 1990s. Hobby boxes promise a pair of autographs, a memorabilia card and a lot of inserts, parallels and short prints. The 2014 Donruss Baseball set has 200 cards. 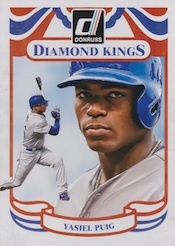 In typical old-school Donruss fashion, it's front loaded with 30 Diamond Kings and 15 Rated Rookies. The remaining 155 cards make up the base portion. Diamond Kings and Rated Rookies both fall four per box, making a full set moderately tough. Among the autograph sets is Donruss Signatures. The 50-card checklist has both current and retired players. Recollection Autographs return. These are autographed buybacks of original Donruss cards. 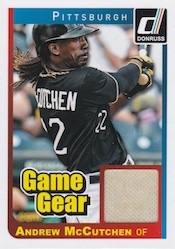 Donruss Game Gear cards include pieces game-used memorabilia. 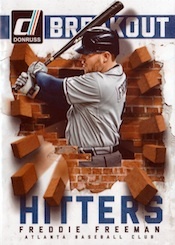 Like the main set, the 2014 Donruss Baseball basic insert lineup is filled with nostalgia. Elite Series and Elite Dominator, two of the earliest serial numbered sets, are both numbered to 999. These also have signed versions that featuring on-card autographs and numbering to 10. 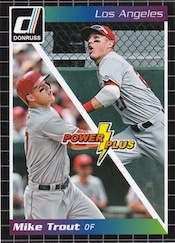 Power Plus (20 cards, 1:8 packs) centers on players who have both a potent swing and speed on the bases. These also have autographed versions. Other inserts and parallels include Breakout Hitters (1:12 packs), Breakout Pitchers (1:12 packs), Hall Worthy (1:12 packs), Non-No (1:24 packs), The Rookies (1:12 packs), Team MVP (1:24 packs), Silver Press Proof (1:24 packs), Season Stat Line (1:24 packs) and Career Stat Line (1:24 packs). Every 2014 Donruss Baseball hobby box also comes with a 5" by 7" Diamond Kings Box Topper. Randomly inserted are autographed versions. View complete information about the wrapper redemption here. Each card includes an embossed Donruss logo and is hand numbered. Good: Base card design is a solid blend of new and old, middle names on card backs, Dominators and Elite Series inserts stand out. Bad: Aims for nostalgia but misses with the details, excessive short prints, parallels just don’t work. 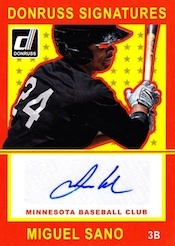 The Bottom Line: When 2014 Donruss Baseball was first announced, it brought back a lot of memories. Many collectors were happy to see a potential alternative to base Topps. Good or bad, this isn’t the Donruss you used to know. It’s a mash-up of a couple of decades worth of past sets with some added modern touches and a dash of licensing limitations. And while it shows great potential in spots, I missed in some of the details that would have enabled a better bridge between the new and the nostalgic. Overall, the base cards do a solid job of capturing cardboard nostalgia. Card fronts are a mashup of 1987 Donruss and 1978 Topps. They’re printed on a glossy stock, which add a modern flair. Card backs are almost exactly like you remember them. They’re boxy and packed with info, just as they were in the 1980s. The inclusion of full names with middle names is one of the small details that weren’t overlooked or compromised. However, it misses with the Diamond Kings. Artwork is synonymous with the subset. Photoshop filters or HDR graphics are no substitute. This is a missed opportunity in 2014 Donruss Baseball, especially considering the fact that art has become a growing niche in the hobby over the last few years. Most of the basic inserts should have a familiar look to them for long-time collectors as they are obviously inspired by Donruss base sets from the brand’s heyday. I have never been a huge fan of a lot of the selected designs so they left me less than enthused. That said, they do a solid job of capturing the spirit. Elite Series and Elite Dominators make a comeback as well, complete with their checkered foil design. These are my favorite cards in the product. While part of me wishes they were numbered to 10,000 once again, I understand why they’re not. The checklist is where this set misses. First, many of the collectors who remember Donruss probably want a big base set more than anything else. 2014 Donruss Baseball has just 200 cards. Of those, the first 45 are short prints. So even with perfect collation, you’re probably looking at seven or eight boxes and tons of extras just to complete it. Short prints work in some products. This isn’t one of them, especially when they come at the start of the checklist. It’s a lot harder for someone to just go after the main part of the set and ignore the short prints. On the insert front, there are too many for my liking. Starting with the parallels, neither Stat Line or Press Proof really fit the mild of what it looks like Panini was trying to go with. Both of these came along later in the brand’s run. One or two total parallels rather than four would have made them more meaningful in my book. Most of the basic inserts serve a purpose and are distinct, but the sheer number of them is a little much. With Rated Rookies in the base set, The Rookies are redundant. It might have been better served for an update set later in the year. With 50 cards each, both the autograph and Game Gear sets are large. While each has some big names sprinkled in, it’s a lot of smaller hobby names. Seeing as how the main focus here deserves to be on the base set, this isn’t too much of an issue if you’re opting for a box or two. All things considered, 2014 Donruss Baseball should probably fit closer to the base Topps price point. Given that the inserts are mostly plain and the majority of hits are less than stellar, it’s unlikely that you’ll find a massive monetary return. That puts the initial price probably a little high. That said, it’s a product that’s meant to be mulled over and sorted, not just ripped and divided into “personal collection” and “depart with” piles. I feel the relatively large amount of short prints work against Donruss. They’ve turned off some set builders, thereby shrinking a market that’s already limited (fairly or not) by the lack of MLB logos. 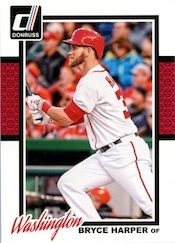 If you’re looking at 2014 Donruss purely as an investment, you’re likely to be disappointed. If you want a big stack of cards that offer some throwback appeal, the price may be slightly above where it should be but that will work itself out over time. Parts of 2014 Donruss Baseball I like. But I wanted to like it more. It’s solid in a lot of regards. The base set is one of the better ones Panini has done with their current MLBPA deal as far as masquerading the lack of logos. That was rarely a thought when I went through the cards. Frustrating to me were the little details like the lack of original art on the Diamond Kings and the short prints. Other things like not having one Team MVP card for every team. These are the sorts of small things that made Donruss Donruss. And that’s where this product loses me more than anything else. Wouldnt it be great it they had a license to put team logos on them…. Is there going to be a retail version of this? 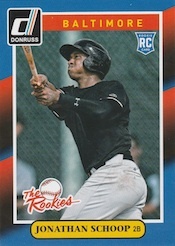 I am excited to see the name Donruss back and the base set looks fine. 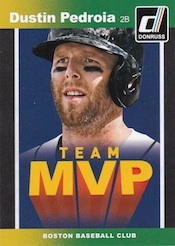 However, I am angered by the Team MVPs insert set. There are several teams that were left out entirely while some teams had multiple players. The MVP subset always featured one player from EVERY team just like Diamond Kings. Panini just announced a wrapper redemption for 3 bonus rated rookie card that will be 201, 202, and 203, but have not released who these cards will feature. Once the names are announced, we’ll add them to the checklist. I’m glad they didn’t put a lot of retired players in the base set! 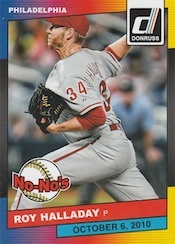 I was looking forward to the Donruss name coming back to baseball cards even using their retro logo, but without the team logos it just seems to be a little lacking. Reminds me of cards I had from Post brand cerial back in the 80s. Are these going to come out in retail? Thinks a really good set, to build for the price. Just wanted to add, pulled 2 memorabilia cards from one of my boxes. Just opened a hobby box…LOVED it!!! Going to buy more! same with me james, my box had an extra game gear mem card. Pretty cool. Just pulled one of the recollection signature cards of Fred McGriff. So what are the details on the wrapper redemption deal? When I heard that Donruss was coming back with a style that was a nod to the eighties and nineties I could barely contain myself. And as pictures and previews began to filter through the Web my excitement grew to levels I hadn’t experienced since I was twelve years old and ripping into packs of 91 Donruss just to see what they looked like in the new year. This is the first time I’d been exited about a product’s base set in well over fifteen years. And when my three boxes arrived in the mail today, I gloriously ripped into them with the passion I felt as a kid. And my impression of this long-awaited product can be summed up in just one word: almost. It’s almost great. It’s almost perfect. It’s almost just like back then. Except it isn’t. It’s a 200-card base set that you cannot complete in three boxes. It’s huge hideous box-toppers. It’s got parallels–but not too many–that are a bit confusing as to their rarity. It’s got inserts (okay Panini, enough is enough), and at the end of my rip, though I was overall very happy, I couldn’t help but think, “what if it was just a little bit more?” I think I would prefer the artist rendition on the Diamond Kings, which, to their credit, are part of the base set instead of inserts, although they’re short-printed, which is frustrating. I love having Rated Rookies that might or might not be big names, though again as with the Diamond Kings, they’re short-printed. 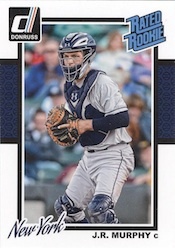 Even considering that, there were still two other cards missing from my base set completion–OUT OF THREE BOXES–in a 200 card set. But enough of that. No guarantees, right? I love this product. What I’d love even more is a full, comprehensive set. Bring back the 700-card monster, I say! And, between you and me, not only are the standard autographs hideously ugly, but I kept asking myself, “who?”, and that’s something auto seekers should beware of. I got five Game Gear from my 3 boxes, and, since they only promise one per box, I suppose I should feel lucky. Except I don’t really care. Jerseys are overdone, not very original, though I didn’t buy for originality, and frankly I didn’t even put penny sleeves on them. The Elite Series is back…almost. These are beautiful cards, along with the Dominator shiney green things. Very nice when you pull one of those, especially considering in the nineties, if you’re like me, you ripped twenty boxes and never got one. Overall I’d say this set, if done with a very large checklist, prettier autographs from people we know, more standardized print runs for the parallels (again, thankfully there aren’t that many), a few less insert sets, would be, dare I say…perfect. That classic look is a winner, and, just like in 91, I’ll be ripping in next year, just as excited. 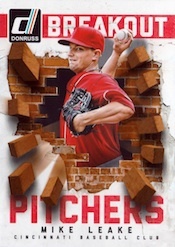 I love the fact that Donruss is back, the look is good and the cards are better stock, etc. 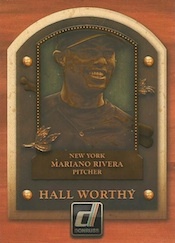 I am SICK TO DEATH of Topps being the only company producing cards. They concentrate on selling high end cards for the money. I like to collect team sets so the more options, the better. As far as team logos, come on man! who are all these whiners wanting team logos? They must be company men, the team logos are just to make money for MLB. Since MLB took over the cards, the merchandise, the websites, everything is now the same and twice as expensive. I buy cards for the players, I know which players are on my team, I don’t need a logo to tell me. I almost quit collecting a few years ago but when Panini came out with a set a couple years ago, I had hope. Topps had pretty much priced me out of the market except for the base set, now I can get some variety! 4��Question??? In putting this set into pages, why is it that that base set starts at 46? Frank � #1-45 are short prints. We’ve separated them for clarity. Without team logos, this set is a joke! My 1978 Topps Football card set is one of my most prized I own, and I never really cared about the logos being airbrushed out. I congradulate the MLBPA for allowing market competition into the trading card industry after the MLB monopoly was instituted. I like these cards a lot, but the SP’s are too difficult to collect for a 200 card set when you only get 8 of the first 45 in a box (diamond Kings and Rated rookies). This ratio would work for a 700-800 card set, but is too low. Otherwise great product, reminiscent of the best days of trading cards; the 80’s! Looking forward to the day when U.S.A. made card companies(Donruss, Upperdeck, Panini) can utilize the MLB logos again. A Topps rep responded to a phone call I made to their customer service department and said some of their baseball cards where made in China. “Americas pastime” made in China….no thank you. Is there a hot-box, “numbered parallel in every pack” element to this product? Anyone? Anyone? Buehler? Buehler? I have broken some of this product and this box is different. Anyway, I love the tweaking and inclusion of auto parallels, many scarce, and the assortment of proofs etc. This is ALMOST perfect. The fact that it is ALMOST perfect, loses it a bit for me. Definitely nostalgia-based! I’ve always thought cards of the 80s and early 90s were ugly, but for some reason, I love it! Cannot explain it. 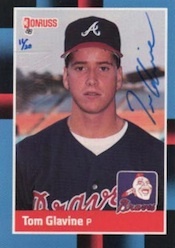 Unlike Topps Heritage, this seems more….genuine. Heritage always feels forced to me. I dunno why. And finally, as much as I want to, I cannot dock Panini for lacking an MLB license. Not their fault. The MLB are run by a bunch of corporate a-holes.